Wednesday October 15 Weather remains same, all as usual with us, I kept busy what time had, aside from usual chores, doing up jobs repairing. Lena busy most of time about house doing up little jobs, so as to go home for few days. 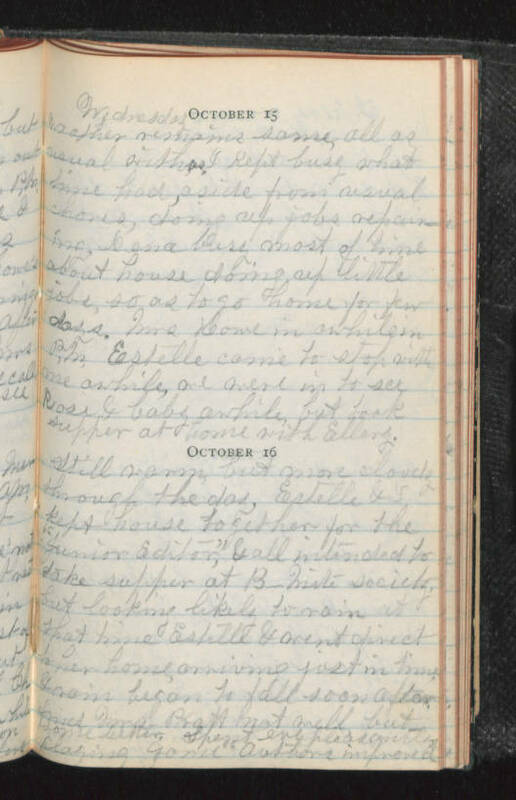 Mrs Howe in awhile in P.M. Estelle came to stop with me awhile, we were in to see Rose & baby awhile, but took supper at home with Ellery. October 16 Still warm, but more cloudy through the day. Estelle & I kept house together for the "Junior Editor", & all intended to take supper at B_ Nite Society, but looking likely to rain at that time Estelle & went direct to her home arriving just in time, & rain began to fall soon after. (?) Mrs Pratt not well but - some better. Spent eve pleasantly playing game "Authors improved"